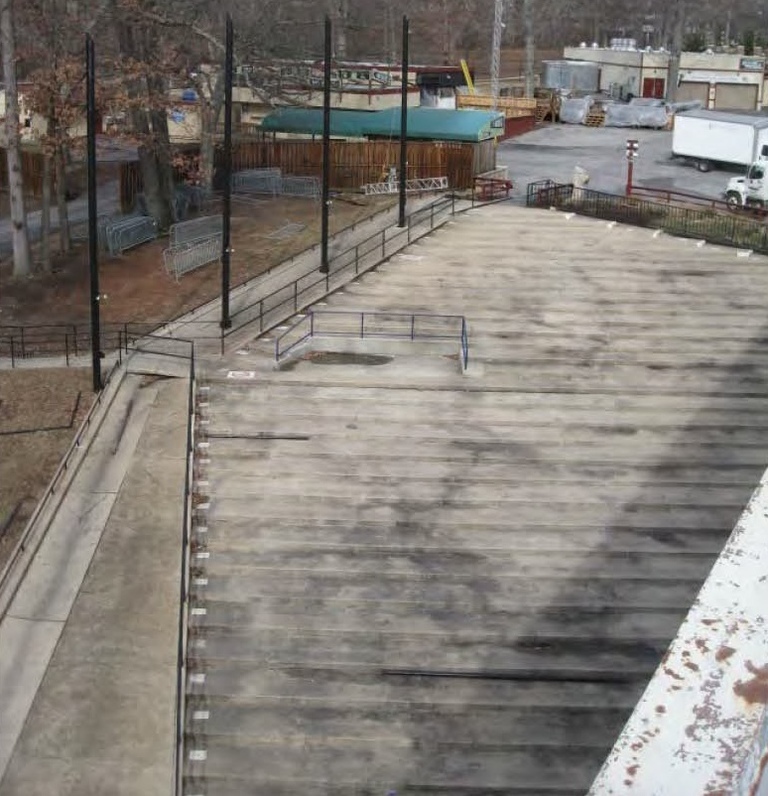 I continue my look into why the Merriweather Post Pavilion renovations are necessary, exactly what is proposed to be done, and how much each set of projects will cost. I conclude with the remaining categories of projects, which consume the other half of the total renovation budget. Recall from my last post that the costs and dates for the renovations are laid out in Exhibits A and B of Amendment 2 to Amendment 12 [PDF] to Council Bill 24-2014. The proposed renovations are based on (but not identical to) the set of renovations described in the recent draft 2014 Ziger/Snead Merriweather Post Pavilion Physical Review Update [PDF], which updated the Ziger/Snead report included in the 2005 final report of the citizens advisory panel on Merriweather Post Pavilion [PDF]. The remaining renovations in Exhibit A fall into the following general categories, in decreasing order by total cost; the budget figures listed do not include soft costs. Note that the exact scope and budget of the individual categories and projects may change based on further design work, and are all subject to Planning Board approval. I have tried to match the items in Exhibit A with the items A through P in the draft 2014 report; however in some cases the correspondence is not exact or is unclear. West loge area at Merriweather Post Pavilion. “Concrete seating risers and masts to support West Loge tents. Note bridge over stormwater swale.” Image and original caption from the draft 2014 Ziger/Snead report, page 37 of the PDF. Construct permanent roofs for the loge areas. This category comprises a single Exhibit A line item (“New Loge Roofs”) budgeted at $1.9 million. 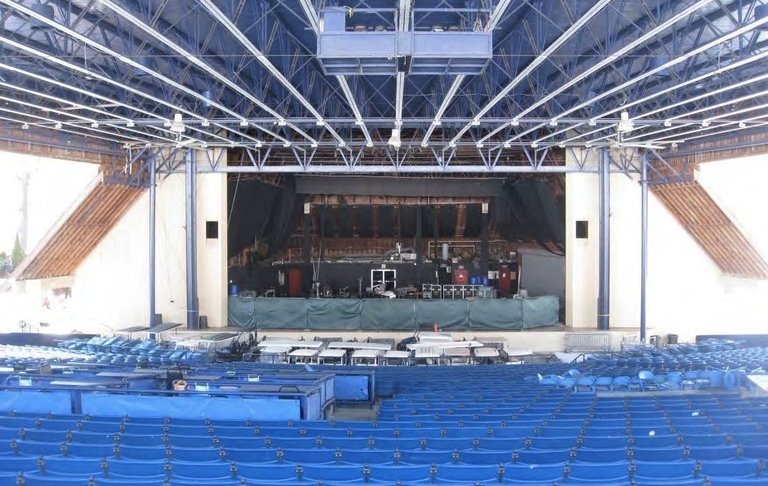 The two loge areas (on the two sides of the main pavilion seating area) currently have temporary canvas tent roofs that are supported by steel masts and guy cables; according to the draft 2014 Ziger/Snead report, in addition to being costly and time-consuming to set up the tents and take them down, the cables impede circulation and the masts obstruct views (pages 13-14 of the PDF). The draft 2014 Ziger/Snead report recommended replacing these temporary tents with permanent roofs that would be visually compatible with the existing main pavilion roof, at an estimated cost of $1.7 million (item E, pages 19, 66, and 71 of the PDF). This estimate also includes putting in a sprinkler system and adding lighting and ceiling fans. Since the budgeted amount of $1.9 million is slightly more than this it’s possible that the plans may include seating on top of these roofs, as proposed by IMP and mentioned above. Path to Merriweather south entrance from the parking fields, showing the relatively steep grade. Image from the draft 2014 Ziger/Snead report, page 27 of the PDF. General site improvements. This category includes two equal-size Exhibit A budget line items (“Site Improvements—Phase 1” and “Site Improvements—East Side”) totalling $1.2 million. 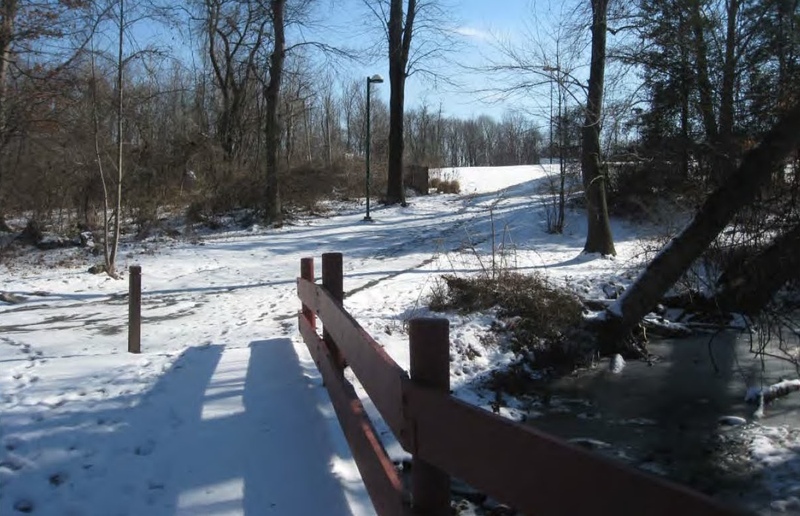 The draft 2014 Ziger/Snead report referenced a number of problems with the overall Merriweather site, many related to site grades and resulting ADA compliance problems. For example, the report noted that the footpath from the south parking areas is “not handicapped accessible, and likely somewhat difficult to negotiate for even certain able bodied individuals” and that “[a]ccess to East Restrooms remains steep and non-ADA compliant” (page 11 and 53 of the PDF). The draft 2014 Ziger/Snead report recommended re-grading of various portions of the site to reduce slopes and improve access, at an estimate cost of $0.7 million (item D, pages 19, 66, and 71 of the PDF). This amount is significantly less than the budgeted amount. It’s possible that the estimated cost in the draft 2014 report was too low (it was unchanged from the 2004 report) or that some additional work has been added. Merriweather stage showing proscenium opening and stagehouse behind. Image from the draft 2014 Ziger/Snead report, page 34 of the PDF. Widening the proscenium and replacing the stagehouse. This comprises a single Exhibit A budget line item (“Widen Proscenium and New Stage House”) of almost $0.9 million. According to the draft Ziger/Snead 2014 report the relatively short width (67 feet) of the proscenium opening for the stage causes obstructed sight lines and degraded sound for some seats in the loge area (pages 8 and 13-14 of the PDF). The stagehouse itself (i.e., the structure enclosing the stage) is also relatively small and lacks a grid for attaching stage equipment (page 8 of the PDF). The draft 2014 Ziger/Snead report recommended both widening the proscenium opening by 15 feet, at an estimated cost of almost $0.4 million (item H, pages 19, 67, and 71 of the PDF), and raising the stagehouse roof 20 feet, adding a grid, and making other improvements, at an estimated cost of almost $1.3 million (item K, page 20, 67-68, and 71 of the PDF). At almost $1.7 million the estimated cost of these two projects is almost twice that budgeted. I therefore presume that the recommendations of the draft 2014 report have been scaled back somewhat. 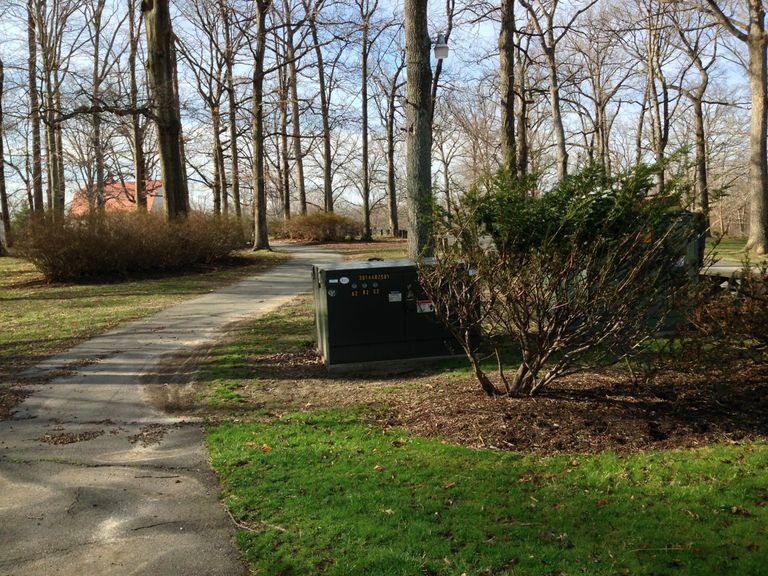 Electrical transformer in Symphony Woods near Merriweather Post Pavilion. Upgrade utilities. This comprises one Exhibit A budget line item (“Utility infrastructure Work”) at less than $0.9 million. The draft 2014 Ziger/Snead report noted that “Most of the original underground utilities serving Merriweather are believed to be either reaching an end to their practical life or are in need of modernizing for the sake of efficiency” (page 12 of the PDF). The draft 2014 report recommended replacing the electrical, water, and utilities serving the site, as well as installing new storm water management facilities and site lighting, at a total cost of $2.5 million (item H, pages 18, 65-66, and 71 in the PDF). That figure is significantly higher than the budget line item, so presumably either the plans are scaled back from what was recommended or the work is included under other budget items. “A total of 31 ADA parking spaces remain outside West Entrance gate.” Image and original caption from the draft 2014 Ziger/Snead report, page 29 of the PDF. Parking. This project is a single Exhibit A budget line item at almost $0.4 million. It is not clear exactly what this project entails. 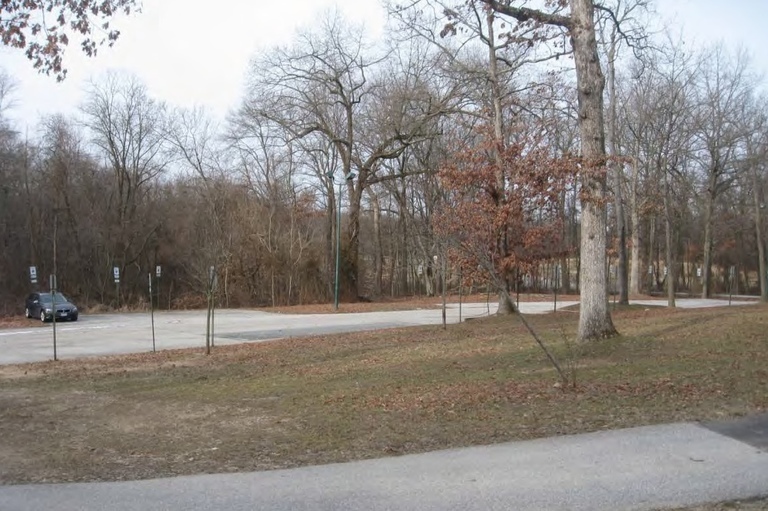 The draft 2014 Ziger/Snead report did not contain recommendations or estimated costs relating to parking, possibly because the Merriweather property itself contains almost no parking: only performer parking (e.g., for tour buses) is on pavilion property, while ADA parking and administration parking is on Columbia Association property (Symphony Woods), and general event parking is on Howard Hughes property (where the Crescent development will go) (pages 6 and 11 of the PDF). The draft 2014 Ziger/Snead report recommended doubling the size of the ADA parking lot in order to meet ADA requirements (page 18 of the PDF). This may be what this Exhibit A budget line item is for, or it may be for something else entirely. Interior of the 932 Club at Merriweather Post Pavilion. 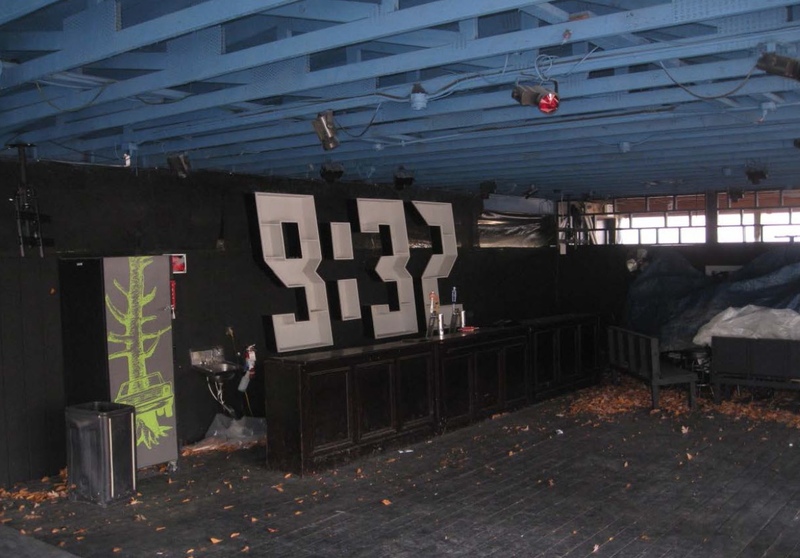 “‘932 Club,’ an Assembly Occupancy, requires a seasonal food permit, and sprinklering is now advised.” Image and original caption from the draft 2014 Ziger/Snead report, page 55 of the PDF. Carry out other smaller renovation projects. This set of projects comprises three Exhibit A budget line items (“Admin Windows”, “Sprinklers in 932 Club”, and “New Trash/Recycling Area”) totalling less than $0.2 million. The historic farmhouse containing the Merriweather administrative offices has single-glazed windows that need to be replaced (draft 2014 Ziger/Snead report, page 15 of the PDF). The 932 Club is a small wood-framed lounge and performance space lacking a sprinkler system (page 16 of the PDF). The property does not currently have a single dedicated trash and recycling area. The draft 2014 Ziger/Snead report included recommendations for projects to address these three areas, all with estimated costs less than $0.1 million (items J, N, and O respectively, pages 19-20, 67-68, and 71 of the PDF). The amounts for the corresponding budget line items are each slightly higher than the corresponding estimated costs in the draft 2014 report. The Exhibit A budget also includes $125,000 for two other line items, preparation of the master plan and FDP processing. This expense, which is for the first year, presumably includes any expenses related to getting Howard County Planning Board approval of the Final Development Plan and Site Development Plan for all of the renovations to be carried out. Finally, there are two recommended projects in the draft 2014 Ziger/Snead report for which it’s unclear whether they are included or not in the Exhibit A budget. These are item L, “Replace Stage Electrical Panels And Distribution” (pages 20, 68, and 71 of the PDF) and item P, “Replace Fire Alarm System For Main Facility And Extend To New Addition” (pages 20, 69, and 71 of the PDF), each with an estimated cost of $0.3 million. In a future post I’ll discuss the schedule for the renovations.